I’m delighted to have the opportunity to recommend Sima Haghighi as the best realtor to retain for your real estate needs.During the past thirty-two years, my husband and I have owned a number of homes in Los Angeles and have worked with different realtors almost every time we’ve bought and sold our homes. As a result, we have accumulated valuable experience that allows us to make knowledgeable comparisons about the quality of service provided by realtors and real estate companies. As soon as we met Sima, we knew she was someone special. Her very presence exudes an air of warmth and sunshine. Her countenance reveals cheerful confidence. Her attitude is consistently positive. And, most important, she listens carefully to the specific needs and desires of her clients. When we retained Sima as our realtor, we presented her with a long list of requirements for our new home. We knew that these requirements would be hard to fulfill and would make the search for a house a difficult one. However, Sima rose to the occasion and with diligence and patience, searched for the appropriate house. She spent many weeks looking at houses to make certain they fit our requirements before making appointments for me to look at them with her. It took some time before we found an acceptable house and many months before we actually found the house we now call home. Despite any discouragement on my part, Sima remained positive throughout the entire process. She was always absolutely certain that eventually we would find the house that fit our criteria and it would be in the location where we wanted to live at the price we wanted to pay. Most realtors are competent enough to do the paperwork required to buy or sell a home. But very few realtors have the character and willingness to take on a time-consuming, difficult project like we presented. And, no other realtor that I know of has the positive personality and philosophy that, on more than one occasion, was a source of encouragement to us. As you can see, we are very pleased with Sima’s real estate services and we feel confident that you will have an equally positive experience. I have been in the real estate business for over 30 years and I have found Sima to be one of the most professional and reliable agents I have had the pleasure of working with. She is very honest and straightforward, and inspires a great deal of trust. She is very knowledgeable about multifamily transactions, is persistent when she needs to be, gets the job done on time, and pays great attention to detail. On a recent transaction in which she represented me as a seller, she took great initiative to prepare the property for sale and saved me a great deal of time by working directly with contractors and other parties involved. I was also very impressed by her creativity and problem-solving skills when unforeseen issues came up On a personal level she is quite pleasant and accessible. I intend to continue drawing on Sima’s expertise and strong connections for both purchase and sales situations in the future and I have already recommended her to others. 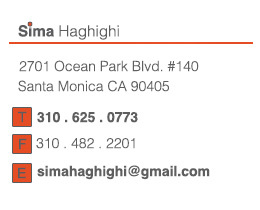 Sima was my real estate agent when I bought my house in Santa Monica 10 years ago. This was my first house purchase and she helped me through every bit of it in a perfect way. I got a great deal on a great house, and she set me up so I got the loan approved through some good people she knew. Last year I contacted Sima again when we decided to sell the house and buy a new one in the valley. Sima once again did an amazing job. She really cares about the people she works for and she works really hard, always available when you have questions and if you are looking for a great trustworthy real estate agent, I highly recommend Sima!!! Sima is a fantastic real estate agent. She’s also a very nice woman who clearly cares about her clients — we had a lot of fun together despite the difficulties of finding (and having an offer accepted on!) a decent house in the current real estate market. I needed to quickly buy a place on the Westside, close to Santa Monica, in December 2012 when the market was extremely tight. Sima’s knowledge of the market, her gut instinct, and, most of all, her persistence (she’s kind and quiet but very persistent) were instrumental in my finding and closing on the house I found and liked. Once my offer was accepted, she guided me through the endless paperwork with knowledge and patience, even pitching in to help the other real estate agent who was inexperienced so we could close on time. Sima’s experience as an architect is helpful in assessing a property’s condition, she’s a great negotiator, and, like I said before, a very pleasant person who cares about her clients and her work. I couldn’t recommend her more highly! We highly recommend Sima Haghighi for her work during our recent home purchase. As first-time homebuyers, we had prepared ourselves for a worst-case scenario year of heartbreak and failed offers. With Sima as our agent, however, that depressing year never happened. We bought one of the best houses we placed an offer on. Sima, represented us so well that our offer prevailed against multiple offers, some of which were higher than ours, in one of the hottest-selling neighborhoods in Los Angeles area. Sima was incredibly responsive, quickly arranging tours, inspections and answered every single one of our questions / emails with rocket speed. I honestly do not know when she sleeps or eats with all the attention she gives to her clients. I know she has many of us, but we genuinely felt like her only clients during the time we worked together. During the course of our transaction, I was so impressed when other people we worked with (loan officers, escrow assistant, inspector) all commented to me in an “off the record” manner that Sima was absolutely one of the best in the industry. Her approach was so natural, professional and compelling. We just wanted to compliment Sima on her style, approach and say that she definitely is in the right profession and either have a well-honed or beautifully natural way of representing your clients or most likely both it was a pleasure having her. We had a wonderful experience with Sima, both selling our home and buying a new home (in Brentwood & Santa Monica). Sima is an excellent real estate agent. She is knowledgeable, smart, experienced, honest and hard-working. She cares about her clients, and you can really tell. Additionally, she has a Master’s degree in Architecture, so her knowledge about homes is quite extensive. My husband and I found this to be very helpful when we were looking for our new home. She answered all of our questions technically and thoroughly and even had great advice for us in terms of remodeling or making improvements. She also knew a lot about the area (the westside) in terms of schools, neighborhoods, safety, pricing, etc.